A 6 to 7 lbs Whole Snapper with head. Broil or Bake is the first is part of the question? With a convection oven what temperature should it be cooked at? What the inside temperature should be? In his book The Science of Cooking, Peter Barham reiterates a distinction made by Rick Stein in his book Fruits of the Sea. When it comes to how one should think of "baking", at least as it applies to fish fillets and whole fish, he divides baking into a pair of subcategories denoted baking and roasting. Baking involves cooking the fish in a deep pan at a moderate oven temperature (15O°C), [that's around 300°F. ], often along with some vegetables, so that some of the steam that rises from the fish and vegetables remains above and around the fish as it cooks. Keeping the fish in an atmosphere of steam helps to reduce the overall loss of water from the fish and retaining a moist product. Roasting is the process of putting a large piece of fish, or a whole fish on a trivet over a shallow pan and exposing it to the fierce heat of a hot (230°C) oven. [That's around 450°F.] When cooked properly, the fish skin will crisp up well providing a good combination of textures from the crisp outer layer to the moist and tender flesh inside the fish. However, the risk of overcooking is very great so this is a method that needs plenty of practice to get the timing just right. The variability of domestic ovens is so large that it is not possible to provide any accurate guide to cooking times for roast fish. You simply have to test to see when the skin becomes crisp and to try to tell, by gently pressing on the fish when it starts to become dry. The idea is to let the skin crisp up, but to prevent the flesh becoming at all dry. So as touches the reliability of method, the form of baking which calls for the lower temperatures plainly offers up up greater reliability for cooks with less experience baking fish, (And by less experience, I really do only mean as compared to persons with more experience), while the form of baking which calls for the higher temperatures is the only baking option or large, whole fish. Therefore, if to choose the baking method, (or in Barham's language roasting), "internal temperature does not need to be measured per se but is more than adequately accounted for (gauranteed correct) by the exterior condition of the fish (crispiness) and moistness of the fish (when pressed down on) at the end of its cooking cycle. Thus it can be said for purposes of baking a whole fish, irrespective of size (within reason), the oven temperature should be set at 450°F (230°C). There are however other important qualifiers which will be spoken to shortly. But first let us turn our attention to what Barham has to say about broiling fish. the method most fraught with risk of ruining a perfectly good piece of fish. Many domestic grills are not very powerful, so by the time that the outside has browned and the flavour developed, (by which he means the Maillard reactions), the inside of the fish may well be thoroughly overcooked. As soon as the fish is lightly browned on one side, put the blowtorch down, turn the fish over and repeat on the other side. The whole process should take no more than a minute or two. So unless one has access to a professional-grade, super high heat producing commercial oven, Barham plainly would have us to abandon even considering putting a fish under our broiler at home, especially a large fish. coat all fish (fat or lean) with a fat before broiling to reduce drying. make a series of parallel cuts across the fish, or in a diamond pattern for larger fish. turn thick cuts once during broiling in order to ensure they cook evenly. Gauging by the language he employs, it is interesting to note that Gisslen is not thinking of fish here in terms of overall weight so much as he's thinking of it in terms of thickness. For a moment of synopsis: If to rely on the above considerations, whether baking or broiling the doneness of the fish is not determined by knowing or measuring inside temperatures. And since the broiling method just means as high as your broiler will go, the only setting one needs knowledge of, (and that for baking), is 450°F or 230°C. The other takeaway is that it is arguable whether one should even attempt broiling whole fish, at least of any real size, in a kitchen oven. Beyond these limitations, in her book The Fishmonger's Apprentice, columnist and author Aliza Green echoes some standardized considerations, or matters of practice, when dealing with fish one intends to prepare, a couple of which are as follows, selected specifically because they involve the use of snapper. COOKING FISH -- Fish that have delicate, soft flesh, such as sea bass, flounder, and red snapper, are especially vulnerable to overcooking. They take well to moderate-temperature cooking such as baking in juicy sauce, and pan-frying (with a coating to help protect the flesh). SLASHING FISH -- Cooked whole, any fish will be juicier, more flavorful, and will lose less of its weight. 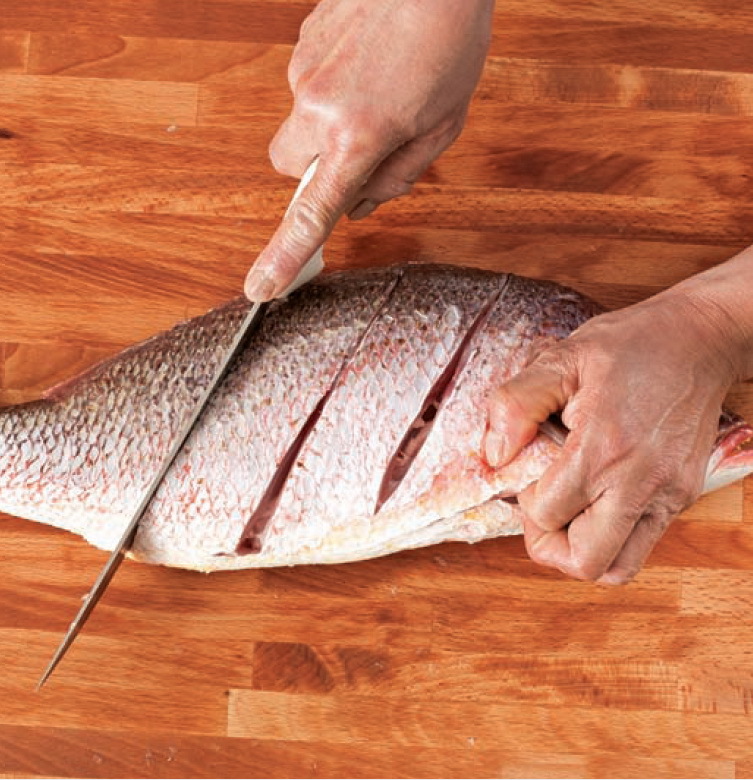 Cutting diagonal slashes (photo below) partway through the flesh of the fish ensures that it will cook evenly when roasted or grilled. How long should I bake a hamburger meatloaf, and at what oven temperature?